Keynesian doctrine on deficit spending is still rampant but Americans should consider a warning from one of their Founding Fathers. The current American government seems ambivalent, at best, about deficit spending. In his State of the Union address President Barack Obama warned that, “If we don’t take meaningful steps to rein in our debt, it could damage our markets, increase the cost of borrowing, and jeopardize our recovery.” Yet besides offering a spending freeze that won’t effect the greatest expenditures of government — defense, Medicare, Medicaid and Social Security — the president volunteered no solution the problem. In all fairness, the record debt that America now struggles with is not Obama’s fault entirely. Massive bailouts of banks, insurers and automakers as well as billion-dollar government guarantees produced an $8.7 trillion increase in federal obligations in the second half of 2008 alone. To put this number in perspective, consider that one year earlier, the United States’ entire debt amounted to $9.3 trillion; that the country’s economic output in 2007 was $14 trillion; and that government spent about $3 trillion that year. The Obama Administration went with the current however and budgeted a spending of $4 trillion in 2009 which represents 28% of GDP, compared to 21 percent in 2008. There are those, like economist Paul Krugman, who demand that government spend even more. Obama is “wrong”, he argues, to suggest that more spending isn’t “necessary” while the economy hasn’t fully recovered yet. The announced three-year spending freeze meets Krugman’s strong disapproval therefore. Krugman is an economist of the Keynesian school which always promotes government spending whenever the economy suffers a downturn. Only the state can boost the flow of credit and the recovery of consumer demand under such precarious circumstances, say the Keynesians. As proof, they offer President Franklin D. Roosevelt’s “New Deal” which, supposedly, dragged the American economy out of the Depression through a massive expansion of government compulsion and controls. The truth is that after two of President Roosevelt’s terms in office, the economy hadn’t recovered at all. Indeed, in 1938, five years after the “New Deal” was enacted, the United States underwent a second recession in spite of all of Roosevelt’s efforts to get the country moving again. The reason? Prosperity demands freedom. Men cannot and will not produce under restraint. Compared to the trillions of dollars borrowed and owed by the American government today, the New Deal was a fairly modest package, costing, adjusted to inflation, about $500 billion. If ever a Keynesian will admit that it didn’t work (and that it was, in fact, the massive production surge demanded by America’s involvement in World War II which prompted recovery), he will probably argue that Roosevelt spent too little; that the New Deal wasn’t big enough. Reiterating Paul Krugman: if the economy is in trouble, government must always spend — and spend more if things don’t get any better. Yet, until the early twentieth century, the United States had largely done without “big government.” Throughout the century before, government spent little; it had to borrow little; and it interfered in few industries. Consequently, the United States prospered. As industrialism reached the American shores after the Civil War, the country experienced unprecedented growth and peoples’ lives improved significantly as a result. This experience had its roots in the philosophy which the United States were founded upon. From its very inception, the United States were a nation of limited government whose constitution didn’t so much dictate what government should, rather what government shouldn’t do: never restrict peoples’ freedoms nor infringe upon their rights; some of which the Declaration of Independence had even referred to as “inalienable”. The Founding Fathers were staunch proponents of small government and the principal author of the Declaration of Independence, Thomas Jefferson (1743-1826) explicitly warned against mounting government debt. If we run into such debts, as that we must be taxed in our meat and our drink, in our necessities and our comforts, in our labors and our amusements, for our callings and our creeds, as the people of England are, our people, like them, must come to labor sixteen hours in the 24, give the earnings of fifteen of these to the government for their debts and daily expenses; and the sixteenth being insufficient to afford us bread, we must live, as they now do, on oatmeal and potatoes; have no time to think, no means of calling the mis-managers to account; but be glad to obtain subsistence by hiring ourselves to rivet their chains on the necks of our fellow-sufferers. Observe that many countries, in Europe especially, maintain a value-added tax on all goods, typically adding 20 percent or so to the cost of products. Most American states know a retail sales tax instead which is more modest than their European counterparts but still follows the logic which Jefferson so dreaded. And note that House speaker Nancy Pelosi suggested in October 2009 that a VAT is “on the table” to help the federal government garner needed revenues. Then begins, indeed, the bellum omnium in omnia [war of all against all], which some philosophers observing to be so general in this world, have mistaken it for the natural, instead of the abusive state of man. And the fore horse of this frightful team is public debt. Taxation follows that, and in its train wretchedness and oppression. After netting, the government’s liabilities are the financial assets of the public–deficit spending *allows* the public to save. This is simply double-entry bookkeeping. If consumer demand (C) drives the AD recovery there is obviously no increase in the government deficit (G)! The point is to positively affect total spending in the economy (i.e. aggregate demand) by deficit spending. Those deficits then form the net financial assets of the private sector so that C does not have to drive the recovery and can achieve its desired savings rate. What is the point now? You mention aggregating consumer demand while denying in the next sentence that consumer demand drives the recovery. Perhaps I’m confused, but you seem to claim that borrowing is what drives the recovery, regardless of how government spends that money. That doesn’t make sense. The billions of dollars now invested in government bonds could else be invested in the private sector. Probably, that would amount to slightly less investment in total, because government bonds are considered a more safe investment, but still. I throw in what you call Krugman bashing because he favors the very opposite of what I think is prudent. Besides, is it really nonsensical to stop for a moment and ask whether deficit spending is moral to begin with, since it’s become such an accepted policy? Nick, I don’t deny that these are difficult issues to understand. But you should really consider the implications of what you are writing. If I say that, in a closed economy (for simplicities sake) the net financial assets of the public are the net financial liabilities of the government (because within a sector, all balances sum to zero), do you know what I mean? Do you disagree? If you want to understand the way deficits function in macro, I think that this is the first thing you need to get your head round. It’s nonsensical to question to the morality of deficit spending? I don’t understand what moral implications you’re aiming at. You’re basically simply explaining how deficit spending works. There are no moral implications. This is just basic double entry bookkeeping. In a closed economy the net financial liabilities of the government are the net financial assets of the public. Thus deficit spending allows the private sector to save on aggregate without destroying output. Judging from what you’ve written here and at your own blog, you seem to assume that economics is a zero-sum game; that there never is any growth. For the record, I certainly don’t believe that. But I have no idea where you’ve got that from in what I’ve just written. We were talking about accounting identities. I got that from your blog post: you seem to consider that money can only come from 1) existing capital or 2) government. You can reduce deficit spending to a mere accounting issue but you’re evading the question of morality in the process. I can’t see any moral issue. Help me to understand. 1) Mounting debt on debt, saddling future generations up with ever higher taxes. 2) Allowing government to spend—and expand—beyond its natural, and proper limits. 3) Fostering political irresponsibility and unaccountability. But none of these make sense. You need the identities to see why. Remember that we are talking about deficit spending. This is a purely technical macroeconomic issue in the final analysis. No, it’s not. It’s a moral issue also, exactly because of the consequences I pointed out. Please, if you will, explain why you think those don’t make sense. 1, Government debt is public asset. Govt owes that money to taxpayers! 2, Cannot define correct size of govt sector in vacuum. Correct size is defined relative to what is needed. 3, Political irresponsibility already endemic. Deploying full resources of economy & boosting total output looks like the opposite of irresponsibility from here. Nothing is gained when output is lost forever. No-deficit will make us all poorer. 1. In part, yes, but other taxpayers are left to foot the bill. 2. I disagree. The correct size of government should be defined by morality, not by necessity. 3. Stop deficit spending won’t “lose output forever” nor do I see how it’ll make a nation poorer. The government isn’t the only party that can create wealth. For evidence of how deficit spending that actually ruin a nation in the long run, may I submit modern day Greece? Greece is part of EMU along with, e.g., Germany (i.e. they share a currency). Germany runs consistent trade surpluses with Greece, meaning Greece is consistently deficit spending into the Germany economy. There is no floating FX to balance trade flows (because of the peg). It’s a bit like Greece is the US government and Germany the private sector (the one getting all the benefits–earning more than they spend). Or it’s a bit like China and America, except the poor country (Greece) is America, and the rich country (Germany) is the one posting the net gain to total income. Greece is deficit spending into the German economy. Huh? Spain was running a 10% deficit (!) last year. See my article, Spanish Socialism is Hampering Europe. Spain entered the crisis with a surplus. Germany with deficit. See linked graph for results. The basis of my philosophy is that “the money has to come from somewhere”–and go somewhere. However, macro is complicated, and if you approach this like you would approach the problem if it pertained to a household or firm, you will miss a lot. Finally, in my analysis of Greece ALL I did was observe a symmetry between a government deficit spending into a private sector and one state deficit spending into another. Spain hasn’t managed to balance its budget since 2008 and the graph reflects that. Compare the situations in Germany and Spain, and I don’t see how you can maintain that deficit spending is a good thing. […] if you approach this like you would approach the problem if it pertained to a household or firm, you will miss a lot. Actually, I think the comparison is a decent one, for neither can keep on borrowing indefinitely. 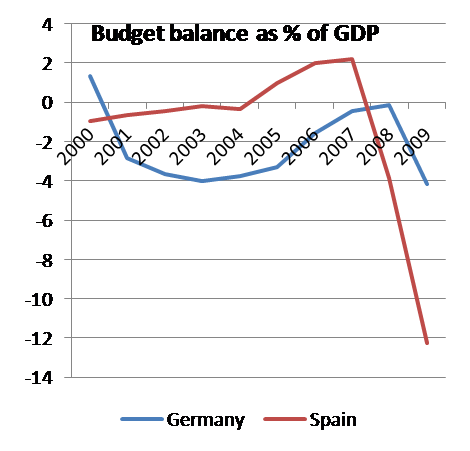 The graph clearly shows Spanish budget balance, as a % of GDP, lies in (-1, 0) for period 2000-2005, trending to 0; then moving sharply into surplus, lying in (0, 2], for period 2005-2008 (roughly); before then sliding sharply into deficit position with onset of GFC proper. Germany’s budget balance constantly in deficit pretty much the entire time from 2001, in (-4, 0]. Don’t you think this strange? How do you explain their trajectories? What I think is remarkable about the differences is that Germany balanced its budget as soon as the recession started whereas Spain plunged further into debt. Of course, that’s not the only factor that should be considered when trying to explain the obvious differences in growth between both countries, but it plays a role. You’re confusing the state with a household or firm. I previously noted that I think the comparison is sound, at least to a certain extent. But please, could you explain what point you’re trying to make with regards to the differences in German and Spanish deficit spending? The Spanish deficit is obviously entirely due to the global financial crisis. It was running a surplus into the GFC and it still crashed through the floor. You might even use the word “cyclical” to describe it. The fact that the Germany budget was in deficit pre GFC explains none of its current behaviour. You need to ask: what is a govt deficit? What determines its behaviour? The fact that the state is not a firm or a household is a way into this conundrum. Incidentally, I lived in Leiden many years ago. Nice place! I’ve lived here for a few years now, and it is, indeed. Where you town for work? The Spanish deficit is obviously entirely due to the global financial crisis. Again, you’re being to vague for me to get what you’re driving at. It seems as though you’re arguing that deficit spending is some sort of inevitability and that mysteriously, everyone profits from it. Please, either be more specific, or we’re going to have to agree to disagree on this one. I went to school in Oegstgeest and lived in Leiderdorp in ’94. It’s just a difficult issue to understand. You need at least some macro accounting & monetary theory to put it together, perhaps. I am trying to simplify. Maybe we can take it in stages. What is a deficit? In any given period, a sector’s deficit describes the amount by which the flow of spending exceeds the flow of income. Obviously any individual can be in deficit, any household, firm or sector. A government deficit means that its expenditure exceeds its income. A private sector deficit means that income exceeds expenditure for this period. In a closed economy, these two balances are equivalent and net to zero, so that for the whole, total income = total expenditure. You can also think of this as total output, GDP, or whatever. Are you with me so far? Agree? If so we can explore what it means for the private sector if the government is in deficit, and what it means for the government if the private sector is in deficit. Or maybe you already know? As I pointed out earlier, you’re ignoring growth. The numbers don’t add up if the private sector is making profits on its own. Are you familiar with it? It’s just an identity. It’s true by definition. If we’re on the same page with this we should go and look at what a deficit is again. Of course, in our theoretical closed economy. As you mentioned, this is the way to look at a country’s GDP. It doesn’t add up if you throw in investments, savings and taxes, though, but I suppose you’re getting to that. It still works if you include taxes, investment and savings. Adding a foreign sector is when it gets exciting. If we divide our closed economy into two identical private sectors (no government just yet), when one is in deficit, the other is in surplus; that is, total spending in one exceeds total income, and total income in the other exceeds total spending by the same amount. That’s just rearranging what we’ve already said. Agreed? It still works if you include taxes, investment and savings. If people are saving, money is draining out of the economy, whereas investments/credit injects “extra” money into the economy. The equation only holds if savings are exactly the same as investments. What happens if one sector is doing its business poorly and losing money—but not borrowing? Obviously, there are leakages. That’s what we’re discussing! So the question is, how can total income exceed total expenditure? Alternatively, how can total expenditure exceed total income? So a govt surplus (T > G) implise a leakage such that total expenditure is greater than total income. Alternatively, a deficit (G > T) implies that total income is greater than total expenditure–because the government is a net addition to the economy as a whole, raising total income without raising total expenditure. Oh, and add the Clinton surpluses–but it wasn’t like these were followed by any kind of crash, right?